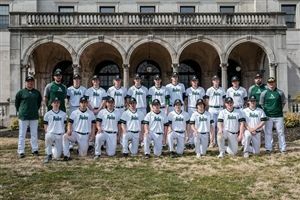 The Archmere baseball team boasted a 4-0 lead early in the game against Conrad at home on April 9th. Senior Mike Dellose, a lefty, cleared the bases with a "no-doubt-about-it grand slam in the bottom of the third to get the Auks started in their 13-3 win over the Red Wolves in six innings in Diamond State Athletic Conference play. The blast flew way over the temporary fence in right field, easily cleared the driveway to the Patio, and landed past the bottom of the hill on the other side of the driveway. It took one bounce and rolled into center field of the softball field." Junior Jack Nielsen threw an 89-pitch complete game to improve to 3-0 on the season. For complete game details and the article, click here.